BELIZE CITY, Thurs. 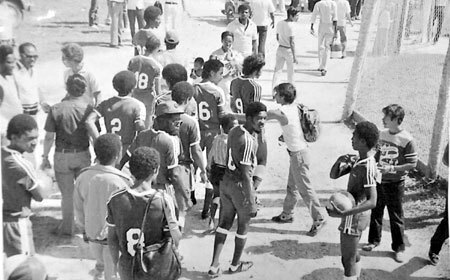 Nov. 10, 2016–The above picture is of a pre-game scene from upstairs of the Guinness Pavilion at the MCC Garden, as Milpros team members head towards the entrance to the playing field near the front gate on a sunny Sunday afternoon in the 1981-82 first country-wide 1st Division competition. The picture (copied and enhanced by Roland Parks) was provided to us by Egbert “Chana” Kisling, the player with the cap and sunshades. Just in front of Chana is Arthur “Goatman” Leslie, and to Chana’s right is Gilroy “Coro” Usher; farther right with the ball is his younger brother, then rookie Earl “Tangi” Usher, pointing upstairs to the cameraman (likely William “Bill” Lindo). To Goatman’s left is #2 Conrad “Can-D” Thomas (deceased). Ahead of Coro is #9 Evaristo “Harrier” Rosado; to his left is #6 Michael Rivero. On the far left near border is Mark “Taypad” Haylock; to his right in sweat-suit is goalkeeper Eddie Daniels, just ahead of yours truly, #8 Charles X Hyde. A fan above Taypad, facing the camera with sunshades is the legendary Rudolph “Sir Andie” Anderson. The player near the top of the picture is Kent “Takeoff” Clother. Above and a little to left of Clother, two men are seen checking notes on a paper; the one to the right with glasses is Radio Belize sports reporter, Manfred Atkins (deceased); and just below Clother is #18 Errol Muslar. At that time, the western sideline bleachers were all gone from Hurricane Greta in 1978; but the Guinness and Brodies pavilions in the north-east corner of the Garden, and the San-Cas pavilion near mid-field on the western sideline, were all still very much in effect. Why have none of them been replaced?